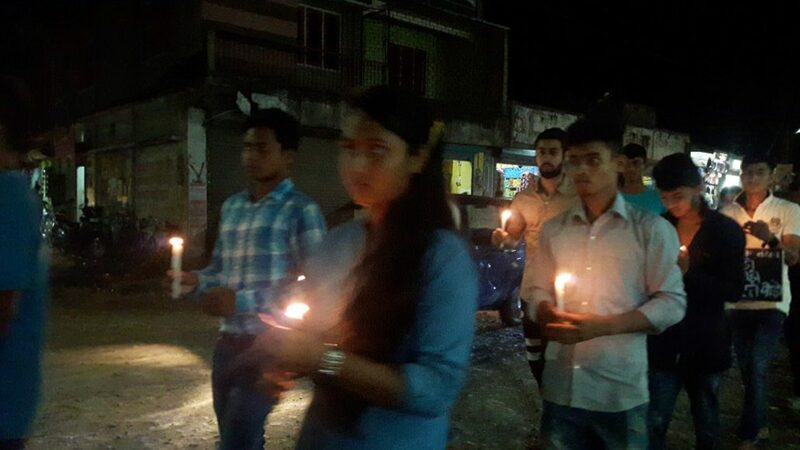 A candlelight rally expressing solidarity with the state-wide protest against the ghastly incident at Panjuri Kachari village under Dokmoka police station in Karbi Anglong district of Assam, where two youths were brutally killed was taken out by the youths of Tangla town in Udalguri under the aegis of a local NGO, Agan on Thursday evening. Youths in unison, irrespective of caste, creed and religion, took part in the silent march throughout the town. Noted cine actor and theatre personality Pabitra Rabha and members of his theatre company Dapon took the lead in the event. Addressing the gathering, Rabha condemning the barbaric killing of two youths said such incidents are fall-out of intolerance among the people. “We need to listen to each other, feel the woes of others for a better society,” said Rabha. He further stated that may the state in its history never witness such barbaric bloodshed and demanded stringent punishment for the culprits as per law. He said that ‘we need to join hands in hands so that justice prevails for the departed souls’, and only then ‘we can reserve the right of being the civilized human’. The gathering called upon people to exercise restraint and appealed to all sections not to communalize the issue.